The Illinois Department of Transportation and Illinois State Board of Education are partnering to encourage schools throughout the state to participate in the annual International Walk to School Day event on Wednesday, Oct. 7. 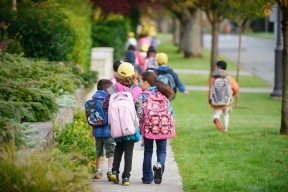 This event originated in Chicago in 1997 as National Walk our Children to School Day, in an effort to create community awareness about making it safe for children to walk to school. Schools planning to participate in the event are encouraged to spend time instructing students on pedestrian safety beforehand. Visit www.walkbiketoschool.org for registration information. Click here for a list of participating Illinois schools. Schools throughout the country held more than 4,700 International Walk to School Day events in 2014.